Safeguard your church's honor by reducing the risk of financial fraud and abuse. Protect your church and your integrity! Do you know the IRS prohibits certain activities for nonprofits? Download this infographic to find out what these activities are. susceptible to fraud or abuse? Read about simple controls your church can implement to strengthen your financial processes. Download this executive summary for best practices that will safeguard the way your church writes checks and makes disbursements. View excerpts from the book in the tablet below. You can scroll up and down and select different chapters. Fraud is not a victimless crime; all of the frauds discussed in this book were not harmless acts, but had dire consequences for the defrauded organizations. If your church has been a victim of a fraud, you are well aware of these consequences. As previously stated, when fraud occurs in the church, there are spiritual consequences as well as financial. The church can lose more than just money. It can end up ruining a leader’s ministry, destroying a church, and shattering people’s faith. It also impacts the organization’s ability to perform ministry and meet the needs of others. –One church that was the victim of a $712,000 embezzlement scheme by their office manager had to cut employee’s pay by 10 percent and cancel a benevolence assistance program for their members. –A Catholic archdiocese that was defrauded of one million dollars by their accounts payable clerk had to close churches and schools because funds designated for Catholic education were stolen. –An employee of the American Diabetes Association embezzled nearly $570,000 from the Association. Instead of helping the twenty-five million Americans who have this disease, the stolen funds were spent at casinos, restaurants, and clothing stores. –A church treasurer who defrauded a Las Vegas church out of 1.75 million dollars caused the church to lose their property to foreclosure. There are several ways to reduce the risk of fraud in your organization. Taking action before fraud occurs, is certainly the wisest choice and would include proactive measures such as training or awareness campaigns and implementing internal control to increase accountability and transparency. However, if you experience fraud at your organization, the actions you take will directly impact the risk of future frauds occurring. These reactive measures would include fixing the process or control weakness that allowed the fraud to occur, taking disciplinary action on the person who committed the abuse, and making other employees aware that abuse of ministry funds will not be tolerated. While disciplinary action is reactive—meaning it is taken after a fraud occurs—it can also be a proactive measure. Taking disciplinary action will let others know that fraudulent behavior will not be tolerated and can discourage others from participating in abuse in the future. –Find out how much money was actually taken (hire a local certified public accountant or certified fraud examiner, if necessary). –Require full restitution of the funds within a specified period of time. –Have the embezzler sign a promissory note, detailing the amount to pay and the specified period of time. –Permanently remove the embezzler from any position within the church that involves handling money. The question on whether to turn the case over to the police or local prosecutor is a question that each organization will have to answer for itself based on the circumstances of the case. This may also be necessary if the suspected embezzler doesn’t confess or it isn’t clear who is guilty. Let me illustrate this by elaborating on two of the stories that will be discussed later in this book. –A trusted volunteer was buying personal items at a local supermarket and charging those purchases to the church. After the volunteer was caught at the supermarket trying to make another fraudulent purchase, she was taken to the police station. The church decided not to prosecute if the volunteer made restitution. However, the volunteer was removed from her position and not allowed to volunteer for a period of time. She was repentant, and she made restitution over the next eighteen months. Although she was not allowed to hold any position in the church that involved handling money, she was restored to fellowship within the congregation. The woman and her husband remained active in the church for several years. –The office manager of a nonprofit organization was caught using blank checks to make personal purchases for herself and her family. The organization initiated an internal investigation to determine the scope of her theft, but didn’t prosecute. In fact, they allowed the office manager to resign, instead of being fired, and didn’t require restitution. She moved out of town and found another job as a bookkeeper at a church. While the church was checking her references, they called the previous employer for a recommendation and were only told that she resigned. Unfortunately for that church, the bookkeeper continued her fraudulent ways and was caught misusing funds again. These two stories highlight the different paths that organizations can take when they catch a trusted employee or volunteer stealing funds. In one case, the perpetrator was required to make restitution and went through a successful period of rehabilitation. In the other case, the perpetrator was allowed to resign and move on without any consequences. Unfortunately, this didn’t stop the perpetrator’s fraudulent ways. The dichotomy of these two outcomes would suggest that taking some sort of disciplinary action is more effective in stopping a person from continuing their abuse at another organization. However, not all organizations take significant disciplinary action. According to the ACFE, 87 percent of occupational fraudsters have never been charged or convicted of fraud and 84 percent have never been fired for fraud-related conduct. While this indicates that many fraudsters are first-time offenders, I believe it also indicates that employers do not always press charges against employees who steal. As a result, they are able to commit abuses at their next employer. But statistics are somewhat encouraging for those organizations that do take action. The ACFE study found that when an organization experienced fraud, 65 percent referred the case for criminal prosecution, while 24 percent filed a civil lawsuit instead of criminal action. When cases were referred to law enforcement for criminal prosecution, 72 percent of the perpetrators plead guilty or were convicted. When a civil lawsuit was pursued, 80 percent received a judgment in favor of the organization or reached a settlement. Unfortunately, while a majority received a favorable judgment, their research also indicates that 40 to 50 percent of organizations do not recover any of their losses. 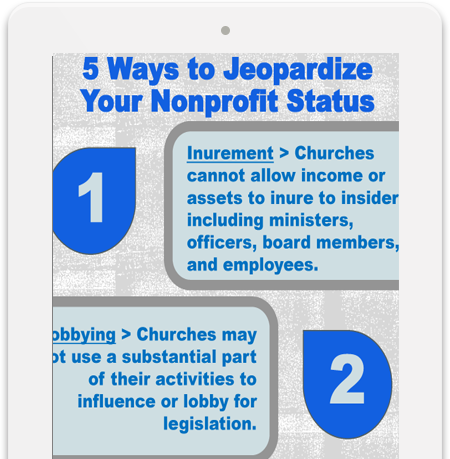 It’s understandable that churches and nonprofits have a difficult time with a decision to prosecute or not. When organizations didn’t refer a fraud case to law enforcement, the most often cited reason was the fear of bad publicity. Airing dirty laundry isn’t a pleasant thought. It reveals your current processes were weak and allowed the abuse to occur. 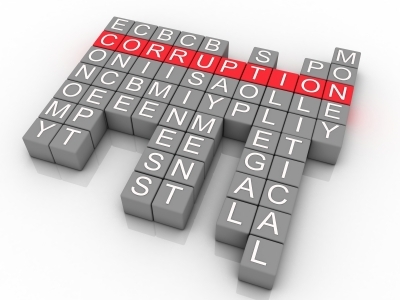 It may reveal that leaders weren’t performing adequate oversight. It will let also donors know that their contributions didn’t further the ministry of the organization, but were used to line the pockets of someone they trusted. Fear of bad publicity is a valid concern. Details of the scandal may be publicized on the front page of the local newspaper and may be the lead story on the evening news. Members may lose confidence in the ministry’s ability to effectively perform their stated goals and donors may move their funds elsewhere. However, let me caution you that a decision to not take action may be just as harmful in the long run. In today’s world of social media, instant communication and constant connections, it is inevitable that news of the scandal will become known. While fear of bad publicity is normal, trying to hide bad news or “sweeping it under the rug” may be just as damaging. ABC Publishing was a ministry organization that printed religious materials, training resources, and Bibles in various languages. Their staff included missionaries, editors, and translators. Many staff and department leaders often traveled overseas to track the progress of their ongoing projects, often leaving a few administrative and support staff alone in the office. The office manager was assigned the task of overseeing much of the office’s administrative duties including purchasing office supplies, office décor, and hospitality items. When the office manager needed to make a purchase, she would submit a purchase request to the vice-president for approval. Upon approval, the chief financial officer would write a check and have an authorized person sign the check. Only the president, vice-president, and chief financial officer (CFO) were authorized to sign checks. If an invoice wasn’t attached to the purchase request, the CFO asked the office manager to return the check stub with an invoice or receipt once the purchase was made. Often, the exact total of the purchase wasn’t known when the purchase request was submitted. The vendor’s name and a description of the items being purchased were on the request, but not a total dollar amount. The organizational leadership agreed to sign a blank check as long as the office manager turned in a receipt afterwards. The first time the office manager requested a blank check to purchase office supplies, the CFO requested she bring back the check stub and receipt. After making the purchase, she carefully folded the receipt so the purchase total was clearly visible and stapled it to the check stub. When she returned the check stub to the CFO, he asked her two questions: “Did the vice-president approve this purchase?” and “Did you attach the receipt to the check stub?” The office manager answered yes to both questions, knowing that the exchange was just a formality since the CFO had the vice-president sign the blank check, and he could see that the receipt was attached to the check stub. The office manager watched as the CFO went to his computer, opened the financial software program, entered the check into the financial records, and placed the check stub in the filing cabinet with paperwork for other completed transactions. She walked away and thought, “That worked well.” Over the next few weeks, she requested a couple more blank checks. After a while, she realized that while the CFO would always ask “Did the vice-president approve this purchase?” and “Did you attach the receipt to the check stub?” he never actually looked at the receipt. Further, the vice-president never asked to review the receipt before she returned it to the CFO. The office manager appreciated the fact that the organization’s leadership viewed her as a trusted employee, but she also realized she had more freedom than she thought. The president shook his head in disbelief and asked the auditor to explain what had happened. As far as the auditor could tell, at some point, the office manager realized that even though she turned in a receipt for every blank check, no one actually reviewed the receipt to make sure the items purchased were business-related. While the auditor didn’t know the reason behind her actions, it was evident that she soon realized she could make personal purchases and use ministry funds to pay for it. When the auditor reviewed the receipts as part of his normal testing, he discovered that gift cards were included in many of these transactions that started with a blank check. The gift cards, which could be purchased near the check-out lane, were clearly identified on the receipts and included restaurant, grocery, and retail establishments. As he looked through the financial files, he determined that these gift card purchases had started approximately eighteen months earlier. At first, the gift card amounts were low, but over time, the auditor noticed that the gift card amounts increased. He also noticed that several gift cards were purchased at a time—each one clearly itemized on the receipt. The auditor noticed that while the office manager had turned in the receipts, she was clearly trying to hide her activity. In fact, she purposely folded the receipt and stapled it in such a way to hide the items being purchased. Someone would have to remove the staple and unfold the receipt in order to view the list of purchased items. The organization’s president confirmed to the auditor that his organization didn’t use or give away gift cards. These gift cards were definitely unapproved purchases. The president confronted the employee and suspended her. The case was then turned over to legal counsel for further review and investigation. By the time the auditor uncovered the theft, the office manager had purchased $9,000 in gift cards, ranging in amounts from $25 to $300. In this case study, the office manager was a very talented and trusted employee. Due to her length of time at the organization, her passion for the ministry, and her accomplishments in the past, she had the trust and confidence of her supervisors. As a result, her supervisors didn’t give a second thought to handing her a blank check. While the CFO provided a measure of accountability by writing the vendor’s name on the check, the office manager’s only required task was to write the amount on the check at the store checkout. However, she abused her supervisor’s trust by adding personal items to the purchase and using ministry funds for payment. –The office manager submitted her purchase for pre-approval, but no manager reviewed her purchases afterward. –The vice-president frequently signed blank checks for the office manager’s use. –The office manager’s purchases were not reviewed to determine if the items purchased complied with internal policies. –The president, vice-president, and CFO all failed to hold the office manager accountable for her purchases. As a result of misplaced trust, this fraud scheme continued for over eighteen months before being discovered. Writing blank checks is a fast and convenient way to allow employees to make purchases. However, signed, blank checks can be easily abused. Not only can the checks be written for more than the approved amounts, the checks can be used for entirely different purchases. Issuing unauthorized checks or “check tampering” is a common fraud scheme. For example, in April 2013, an office manager was sentenced to almost three years in prison for embezzling more than $900,000 from her employer using this scheme. She was able to convince the check signers at the company to sign blank checks under the assumption that they would be used to pay company expenses. Instead, she cashed the checks and used the money for her own personal benefit. Once the blank checks were signed, she tried to conceal the fraud and implicate someone else by making the checks out to another employee and then forging the employee’s endorsement on the back of the check. Besides the fraud, she was also convicted of identity theft. One recent fraud study found issuing or forging unauthorized company checks was the most common embezzlement scheme. Another study found that check tampering was the second most common fraud scheme perpetrated on religious and charitable organizations. Unfortunately, the median duration of check tampering schemes lasted around thirty months before being discovered at these religious and charitable organizations. The interim pastor sat down at his desk, opened the mail and scanned the monthly statement for fuel charges. As the vendor intended, the bright red “past due” notice caught his eye. He had only been interim pastor for twenty days, but he didn’t recognize this charge account. He was prepared to find a few bills that might have been overlooked during the transition, but as he reviewed the church’s financial files, he didn’t see any past activity for this particular company. “This must be a mistake,” he thought to himself. He set the bill aside and made a mental note to have the secretary call the company and have them correct their mistake. The next day, the pastor received another confusing bill in the mail. This time, the bill was from a local wholesale club and the balance due was significant. A quick scan of the monthly statement determined that a majority of the balance had been carried over from the previous month. Only a small payment had been made in the past thirty days to fulfill the minimum payment due. Because the total amount was not paid in full, substantial finance charges were accruing. “Is this another mistake?” he thought to himself. The pastor was thoroughly concerned when he opened another envelope that contained a monthly installment bill for two desktop computers. He looked around the offices and noticed a new desktop in the bookkeeper’s office, but he couldn’t find a second one. He looked through the office files again, but didn’t see any paperwork that showed the church had purchased any computers. The pastor laid the paperwork down and considered the possibilities: Could all of these bills be a mistake, or was something else going on? He decided he needed help to figure this out. The auditor arrived the next week and began reviewing the church’s financial files, including the suspicious bills that the pastor had received. After interviewing current staff and reviewing financial reports, general ledger details, bank statements, cancelled checks and other office files, the auditor had a clear understanding of the church’s financial condition. The pastor called a special board meeting and asked the auditor to join them. The auditor shared his findings with the board and revealed some disturbing news: The former pastor had used church funds for personal expenses and concealed this activity from the board and bookkeeper. The auditor proceeded to describe the depth and breadth of the abuse. The former pastor used church funds to make monthly payments on his personal charge accounts and credit cards. These payments were made through electronic fund transfers. Additionally, he had been using the church’s charge accounts for his personal benefit. To add insult to injury, the auditor explained that the abuse had significantly affected the church’s cash flow. The abuse had become so rampant and encompassed so many accounts, that there weren’t enough funds each month to pay for these fraudulent transactions, let alone the church’s valid expenses. As a result, the former pastor had to resort to making minimum payments on many of these accounts because the church’s weekly cash flow wasn’t enough to pay the entire amounts. This exacerbated the problem since the church was accruing finance charges and late fees that added to the outstanding balances. The board members were visibly stunned and wondered how this was concealed from them. The auditor explained that the pastor’s access to the bank accounts allowed him to make several electronic fund transfers each month. He picked up the mail each day, which included the monthly bills, credit card statements, and bank statements. The pastor would tell the bookkeeper which checks to write and for how much. Neither the bookkeeper nor board members saw the actual bills or statements. Unfortunately, while the board received a summary financial report each month, it lacked sufficient details that would have allowed them to see this abuse. –Using church funds to make electronic payments on three personal credit cards. The monthly payments ranged from $100 to $500 for at least two years. –Spending up to $17,300 for personal items at a local wholesale club. –Charging gasoline purchases to the church for family and friends—at least twenty-six purchases over a two-month period, and sometimes charging gas at multiple locations on the same day. –Using church funds to pay for a computer that he gave to his wife. –Having the church incur finance charges and late fees totaling $4,000. The board discussed how the church would recover and move forward. They decided against taking legal action, but did provide the auditor’s findings to the former pastor’s ecclesiastical leadership. Unfortunately for the church, they had to make significant cutbacks in their planned spending over the next twelve months in order to pay off these outstanding balances. In this case study, there was a lack of accountability and transparency in the church’s financial operations. The former pastor was able to conceal his abuse of funds by having direct access to the bank account and bank statements. He also directed the bookkeeper to write checks, and directed board members to sign checks, without providing supporting documentation. In the nonprofit world, trust is a much-desired character trait. I’ve often heard leaders say, “I give people my trust, until I have a reason not to.” Certainly, this is a worthy attitude to have in our interpersonal relationships, but within the financial arena, trust is not an effective control. This church did not have sufficient controls to ensure that disbursements were proper and adequately supported. The former pastor had online access to the bank accounts and would pay several bills electronically, without anyone knowing. The supporting invoices and monthly statements were not kept in the church office or provided to the board for review. The former pastor would open the mail, pull out the bills, determine which ones should be paid, and give a list to the bookkeeper that contained the name of the vendor and the check amount. The bookkeeper would prepare the check, and a board member would sign the check and return it to the pastor for mailing. However, the person signing the check did not have the corresponding invoice to review when signing the check. While the board received financial reports each month, they only received summary reports. They didn’t have access to general ledger details that clearly identified all transactions. Without access to the invoices or general ledger details, many of the payments authorized by the former pastor (whether by check or electronic funds transfer) did not have an appropriate level of accountability and transparency. Accountability and transparency are the key components of good stewardship. Because churches and nonprofits rely on donated funds to continue operations, it is crucial to have accountability and transparency for donor confidence. Accountability and transparency will also protect church leaders from accusations of impropriety or self-dealing. –A Virginia woman pleaded guilty to embezzling nearly $570,000 from the American Diabetes Association. For over nine years, the treasury manager initiated 133 unauthorized wire transfers from the Association’s bank account to a personal bank account that she controlled. To conceal her crime, she altered approved purchase request forms and accounting records to make the transfer look like legitimate expenses such as postage charges. –A grand jury indicted a forty-year old woman for allegedly embezzling more than $453,000 for her employer. For almost three years, the employee initiated electronic fund transfers from the company’s bank account into her own bank account. –When paying by check, the bookkeeper should prepare checks for payment and a board member or other authorized signer should sign checks only after reviewing supporting invoices. –When paying by electronic fund transfer, the invoice should be reviewed and approved by a board member or other authorized signer before payment. The board member should initial the invoice and make a note that it would be paid via an electronic payment. –Supporting documentation should be filed by vendor, with either the check stub attached to the invoice, or other notation that includes date paid and check number. As an additional level of accountability, empower the bookkeeper and board members to ask for supporting documentation or additional details when preparing checks, signing checks, or recording the financial information. Further, a complete set of financial reports, including details of every transaction, should be provided to the governing board, or the finance sub-committee, each month. The Chief Financial Officer (CFO) handed the business credit card to the new employee with a strict warning: “This is not a license to spend money indiscriminately. We have strict controls over the use of credit cards in our organization. This credit card is provided as a convenient way to make purchases, but those purchases must be approved in your departmental budget and you must turn in receipts for each and every transaction. We have additional requirements regarding use, approval, and documentation in our policy manual. I expect you to read it and comply”. Fortunately, the CFO required all employees to follow the established policies. When the monthly credit card statement was received, all employees were expected to attach receipts, identify the business purpose of the expense and note the appropriate account to charge the expense to. The Accounts Payable (AP) clerk was empowered to follow up with any employee who didn’t follow the established procedures. That is, every employee except the CFO. Over the years the AP clerk noticed that while all employees attached their receipts to the credit card statement, the CFO would place his receipts in an envelope and seal it before giving it to the clerk. The clerk was instructed to post all employees’ expenses to the appropriate ledger and pay the monthly bill. 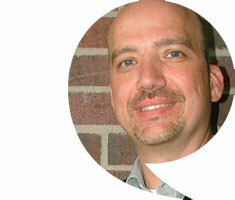 However, the CFO stated that he would post the expenses for his own activity. It seemed appropriate to her that the CFO would want take an interest in the financials and post some of the activity. But now, as she scanned some of his activity, she became concerned. Many of the expenses didn’t seem appropriate for their organization, and other employees didn’t make similar purchases. She dismissed her concern by thinking, Surely, the CFO would know what expenses were appropriate or not. However, the charges continued for several months, and the CFO continued to submit his receipts in a sealed envelope. The AP clerk continued to file the envelope away and make the payments. While her suspicion was growing month after month, she continued to dismiss it. As the AP clerk reviewed the current month’s credit card bill, her heart sank. The CFO had made a purchase that was clearly not business related. Further, the transaction was not appropriate for an employee of this non-profit organization, let alone the CFO, who was also a minister. She knew it was time to let someone else know about her concerns. As the AP clerk explained her concerns to the president of the organization, she showed him the CFO’s credit card statement. The president confirmed that many of the transactions were not appropriate. He was surprised that the CFO sealed his receipts in an envelope while all others were expected to attach them to the statement; however, he admitted that he didn’t require the CFO to submit his purchases for approval. Together, they reviewed the statements for the past twelve months. The president verified that multiple transactions each month were not appropriate, and decided it was time to confront the CFO. Faced with the evidence presented, the CFO admitted that he used the organization’s credit card for personal purchases and offered to make restitution. The president agreed and stated that he would request an audit to determine the total amount. An audit revealed that during a four-year period, the CFO charged at least $20,000 in personal expenses to the organization. However, it was apparent that the abuse had been occurring longer. The abuse included purchases at local home improvement stores, frequent lunches near the office, frequent coffee and snacks around town, large purchases at clothing stores, extravagant meals while on travel, Starbucks gift certificates, golf items, and movie rentals at hotels. The president terminated the CFO’s employment and implemented new controls to keep this abuse from happening again. In this case study, the CFO had established very strong controls at this ministry. The accounts receivable and accounts payable functions were performed by separate people. Disbursements were properly approved and adequately supported with invoices before a check was written and signed. The bank reconciliations were performed by someone who didn’t sign checks. All employees were required to provide receipts for all credit card transactions, which the chief financial officer reviewed for appropriateness. Unfortunately, no one reviewed the CFO’s credit card transactions. No one held him accountable for his purchases. When he deviated from the established policies that everyone else had to follow, no one stopped him. While he was empowered to question purchases made by other staff members, no one was empowered to question his purchases. This lack of accountability allowed his abuse to continue for more than four years. Although the accounts payable clerk noticed his deviation from established procedures, she finally had the courage to blow the whistle when she noticed suspicious transactions. Credit cards are certainly a convenient way to make business purchases. They don’t require any approval before use and are accepted all over the world. Unfortunately, these benefits contribute to their frequent abuse. However, just like other expenditures, credit cards require adequate substantiation for all business expenses. Often times, though, it is hard to keep track of all those receipts—especially, if you are trying to conceal your activity. Credit card statements must be supported with receipts. The credit card statement will reveal that a purchase was made, but in most cases, the item or service being purchased will not be very apparent. For example, the statement will review a purchase was made at a department store, but it will not describe the items purchased. Further, in order to comply with IRS requirements for an accountable plan, actual receipts are required for credit card purchases. The business purpose will need to be identified. Further, for any meals or entertainment expenses, the names of those attending need to be identified. Besides providing adequate support for every credit card transaction, it is necessary to have each transaction reviewed to determine if the purchase is an appropriate business expense. Without the itemized receipt, the appropriateness of the transaction cannot be determined. In this case study, while the CFO reviewed the appropriateness of purchases for other staff members, no one was reviewing his purchases for appropriateness. This case study revealed one leader’s activity was not transparent or accountable. To minimize this risk in your organization, foster a workplace environment where transparency is encouraged and accountability is welcomed. Create accountability measures between leadership and empower staff to hold each other accountable. Get your copy of Integrity at Stake now! Every employee in the church or non-profit ministry plays a part in preventing fraud. No matter your title or role, this book will reveal how fraud can occur in ministry, and how you can prevent it. As pastor, you may also fulfill the role of president, chairman of the board, or chief executive officer. You probably don’t count the offering, make deposits, or post transactions into the financial records, but you decide when and where funds are spent. You also have the authority to bypass established policies, which sometimes circumvents controls. This book is for you to help you realize the importance of implementing and enforcing a system of internal control. Your role includes managing the financial operations and providing reports on the current status of finances. It is important for you to know financial controls are in place and operating effectively. Whether your title is accountant, bookkeeper, finance specialist, or accounting clerk, you handle the day-to-day financial transactions for the organization. The accuracy and integrity of the organization’s finances rests with the accounting team. This book will help you identify ways to separate key duties to increase accountability and reduce risk. Your role, as the governing board, includes making sure finances are managed effectively while propelling the organization forward in fulfilling its mission. You’ll want to make sure segregation of duties and other financial controls are in place to safeguard the organization’s assets while protecting the integrity of the organization and its staff. 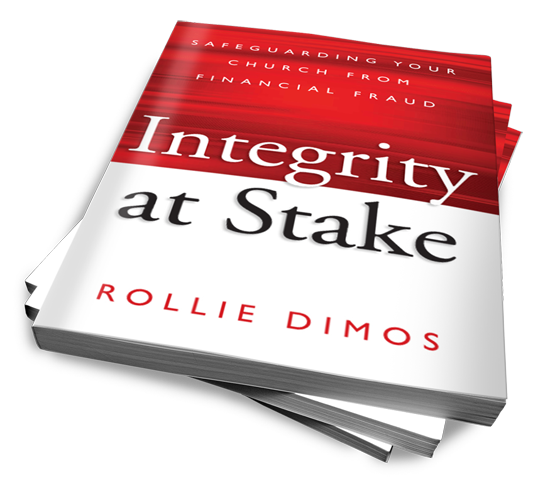 My friend and colleague, Rollie Dimos, has devoted his life to helping Christ-centered organizations earn and maintain high levels of trust, through developing high standards of accountability and practice. He gets it…both the ministry and management! Integrity at Stake is not a fictional book. These are actual situations that caused financial setback and were embarrassing to the ministry. Interestingly, each of these could have been avoided if greater accountability and transparency were embedded in the ministries policy and practice. Integrity at Stake provides valuable information and insights on issues every church must manage well. Each subject is presented in an easy-to-understand manner that will prove helpful both to the expert and to those just learning the basics of managing church resources. Rollie's knowledge, experience, and heart for the local church shine through proving that he clearly wants to help every church leader. I wish each pastor and church treasurer among our nearly 13,000 congregations had a copy of this book! Integrity at Stake serves as a wake up call for all of us and it gives us strategy and guidelines to implement better accountability and transparency. It's information that we all need. Integrity at Stake is well done and greatly needed. I particularly found the statistics from accounting firms to be interesting. I felt your tips were clear and precise to help prevent fraud. And the case studies played to my "curiosity factor" to see who did what and how. 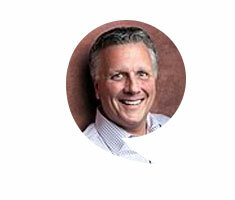 Rollie Dimos is a certified fraud examiner and certified internal auditor. Rollie has a deep desire to help church leaders reduce the risk of fraud and increase financial accountability and integrity. As an auditor in the government and nonprofit sectors, Rollie has been helping leaders assess the strength of their organizational controls for over 25 years. He is a graduate of Evangel University and the Assemblies of God Theological Seminary, and resides in Ozark, Missouri with his wife and children.